The melting of polar ice caps I believe is another severe effect of global warming. Sea levels are predicted to drastically rise. The sea is estimated to rise 230 feet! Within the next five to seven years, the ice caps could be completely melted. The global ecosystem will be completely thrown off balance because of the melting of these polar ice caps. 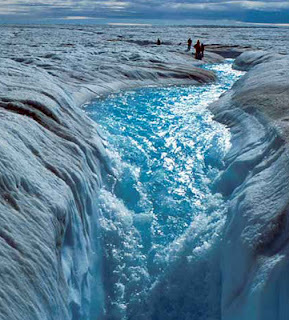 Polar ice caps are our fresh water resource. As they melt, the fresh water will diminish into the ocean water. The fresh water will make the ocean less salty. Less salty water will mess up ocean currents, which regulate temperatures. As temperatures rise, the changing landscapes in the Arctic Circle will endanger several species of animals. The most adaptable animals are the only ones that will be able to survive!! With the polar ice caps gone, I believe global warming will escalate. The ice caps are white and reflect sunlight. The sunlight is mostly reflected back into space. This helps to keep the Earth cool. With the ice caps melting, the sunlight will no longer reflect into space as much. The ocean will become darker. Dark colors absorb sunlight. This will cause the ocean to heat up, furthermore contribute to global warming. =, By. "Are the Polar Ice Caps Melting?" The New American. Web. 28 Oct. 2010. <http://www.thenewamerican.com/index.php/tech-mainmenu-30/environment/2871-are-the-ice-caps-melting>. Kid.Ouch, By A. "5 Deadliest Effects of Global Warming." Popular | Environmental Graffiti. Web. 27 Oct. 2010. <http://www.environmentalgraffiti.com/sciencetech/5-deadliest-effects-of-global-warming/276>. "NOVA | Mystery of the Megavolcano | Why Toba Matters Image 6 | PBS." PBS: Public Broadcasting Service. Web. 28 Oct. 2010. <http://www.pbs.org/wgbh/nova/megavolcano/shin-06.html>. I'm doing an assignment based on Global Warming as well. The loss of white ice caps can also accelerate heating because uncovered earth and ocean does not reflect light as well as the ice does. The less ice there is, the hotter it gets. AS it gets hotter, more ice melts. I wonder how long it will be before this all spirals out of control.